Temkin has been acquired by Qualtrics. Read our blog for details. To examine the link between Net Promoter Scores® (NPS®) and loyalty, we surveyed 800 IT decision-makers from large North American firms to learn about their relationships with their technology providers. Of the 62 tech vendors we evaluated, SAS Institute, HP outsourcing, and Intel earned the highest NPS, while Accenture, CA Technologies, and Hitachi received the lowest. Overall, the tech vendor industry’s average NPS jumped to 31.8 in 2015—an increase of more than eight points—after two straight years of declining scores. Our analysis shows that promoters are much more likely than detractors to spend more money with tech vendors, try new products and services when they are announced, and forgive their tech vendors after a bad experience. Our results also revealed that SAS Institute and Cognizant outsourcing were the top companies for purchase momentum, IBM SPSS and Intel have the highest Temkin Innovation Equity Quotient, and HP outsourcing and Intel scored the highest in the Temkin Forgiveness Ratings. The report includes graphics with data for NPS, purchase intentions, likelihood to forgive, and likelihood to try a new offering. 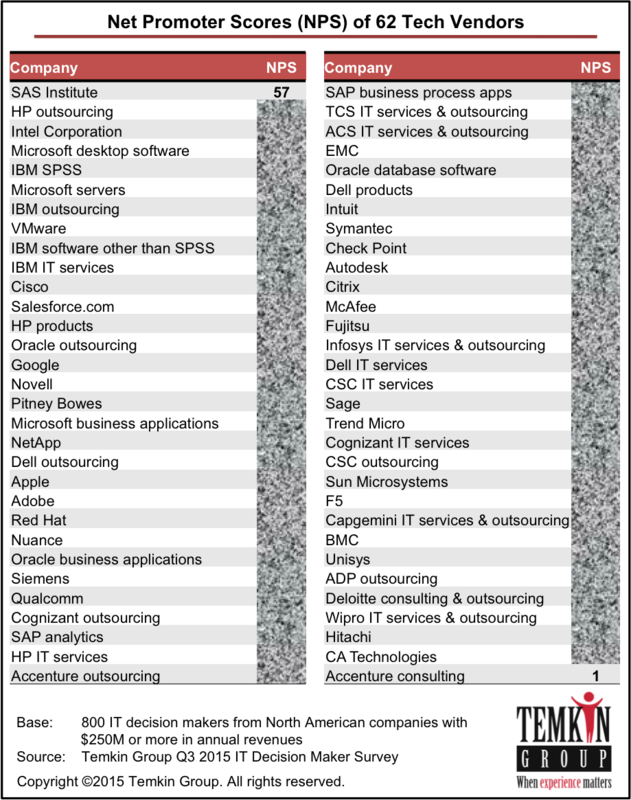 The excel spreadsheet includes this data (in more detail) for the 62 companies as well as for 25 other tech vendors with less than 40 pieces of feedback. It also includes the summary NPS scores from 2014. After declining for the past two years, the industry average NPS increased to 31.8 this year, almost reaching the level from our initial study in 2012. The research also includes data for Purchase Momentum (how much customers are planning to buy), Temkin Forgiveness Ratings (likelihood of customers to forgive after a bad experience), and Temkin Innovation Equity Quotient (likelihood of customer to try a new offering). 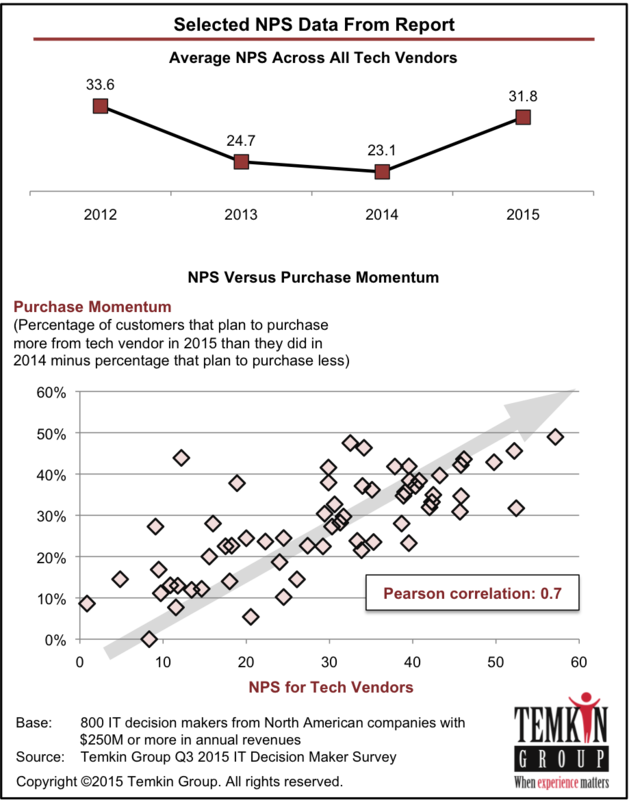 We not only list the results for each company, but we also show that NPS is highly correlated to each of these items (as you can see below for Purchase Momentum). Bruce and Amy are a dynamic duo that used their great organizational instincts to set the pace for the culture work at Anthem, and ensure that we had stakeholder buy-in and top down commitment every step of the way. They helped to shape the high impact portfolio of culture work that is underway today. Want a more customer-centric organization? Contact Temkin Group. Click Here. Copyright © 2019 Temkin Group.